What's the perfect gift this Christmas season? The correct answer is... anything handmade. If you are in my family don't be surprised when you open one of these corsage tees from Santa... even if you're my brother. Okay, I will limit it only to the girls. 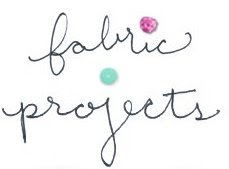 I am going to post some of the tips for making the fabric embellished tees I showed on Studio 5. 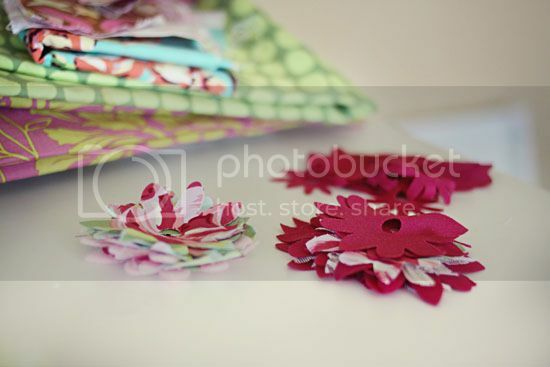 The first tee is seen below where I mixed different fabrics, sizes & layers of rosettes. 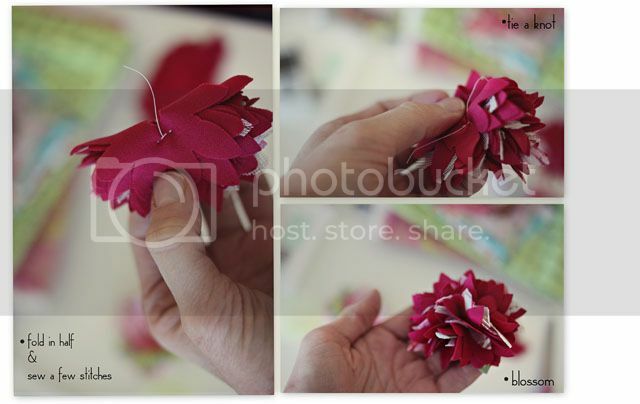 For these rosettes I used a die cut flower from Sizzix. If you don't have a die cut machine Martha Stewart has some great instructions and templates here. What fabric should you use? Any. I used knit fabric because the ends don't fray when you wash them. I also used a twill fabric for the grey rosettes because I liked the texture. I applied Stop Fray to stop the ends from unraveling more then they already have. I also used some vintage lace (thanks Margie!) and leftover quilting fabric. Layer fabric & lace. Fold in half and stitch a few stitches along the fold with a needle & thread. Making sure you go through each layer. Tie a knot & the fabric just blossoms... so easy! Just sew them to your favorite tee. PS THANKS so much for all the wonderful emails I've received the last couple days. If I could, I would send a hug through an email to all of you!! xo I have the coolest blog readers! OOOOHHHH... I love this idea!! I have to run out to buy some fun fabric right now!! Thanks for another fantastic idea... you're awesome! you are amazing~ love this!!!! I love this shirt, so cute. I have been dreaming of doing this for months now. My sister is totally going to get something like this for Christmas (don't tell). Cute, cute. I wish I were on your Christmas list. Very cute! If I tried to do this it wouldn't look that good. To bad you don't have an Etsy store. I am so excited you posted how to do this. I can't wait to try it out. Sew (hehe) gonna try these super cute flowers!! Also wanted to tell you how amazing Spark sounded-wish I could have been there!! Liz: I would LOVE for you to make me some of these! I am so not talented AT ALL when it comes to things like this. I would be happy to pay you for them! Please let me know if you would be interested! P.S. I would want like four or five different sets! I love the colors you have. You never cease to amaze me with your talent. Thank you for sharing this with us. I definitely need to make some. How do you wash the tee after it has the flowers on it? Like delicate cycle with shirt inside-out? Beautiful shirts, the flowers are amazing! Your family members and friends are going to love them! They are so lucky! That's so cute. I'll def have to make some of these! I too love these, and am also NOT talented in the sewing department......if you were willing to sell them to the previous poster, I would soooooo love to get my hands on these as well! I just know that yours will turn out so much cuter!! Please, Please let me know if I can buy some, my email is jennyesterbrook@yahoo.com If not, could you tell me where you got the tees that you used in this picture? it's a flattering fit and I haven't seen one like that lately. Thank you!! I'm with Jenny above..I can papercraft but TOTALLY lost when it comes to sewing..if you're interested in selling these.. I'd love once just like you have featured here! Not picky on the colors..but would just LOVE one! If you are selling them, you can get a hold of me at d.petrick@hotmail.com! BEAUTIFUL Liz! My friends and I were wondering how you made those flowers...so cute! Thanks for posting this. OHhhh, ahhhhh! This is soooooo stinkin cute! LOVE! I'm off to gather up fabric scraps! Thanks for the great tutorial. cant wait to try this! love it! Thank you for the tutorial and the wonderful idea. I would love to know where you got your favorite tee? fits perfect! That is so super cute and you made it look so stinkin' easy. Love it! I bought some great fabric quarters just yesterday to put a couple of these shirts together for sisters. Thanks for the quick tutorial. Oooooh I wanna be a part of your family now - those are amazing! Thank you so much for posting this, I've been waiting and searching the internet for directions. I've printed off the template from the Martha Stewart site. Do I use the same technique for making the hairclips? Thank you so much. Love your blog and can't wait to get your new book!!! I love this idea! I have a ton of fabric I've been trying to decide what to do with! Thanks for the continued inspiration, and congrats on your success! This is so cool! I'm going to have to try this for sure! Thanks for the tutorial and inspiration! that makes for such a very beautiful tee. i too would really like to know where the tee itself is from. the scoop neck and slim fit adds to the over all look. thanks for the tutorial too. Gorgeous!!! You are gifted, girl! These are so cute!! 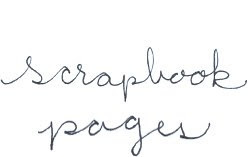 I stumbled upon your blog last week and I love it. I hope you don't mind my lurking:). You have such cute, creative ideas...very talented! Oh, your shirt turned out so cute! You have such a great eye for color. I'm always scared of laundering things like this, so I used a similar technique to make a headband. However, now I feel like I need to be brave and try that "no fray" stuff you mentioned. Thank you so much for sharing this! I really love this idea. Curious to know where you got the t-shirts from? If you wouldn't mind posting that detail, I'd appreciate it. Congrats on the book! Can't wait to get my hands on it. oh so cute I am going to to this for sure! he he he I am giddy just thinking about it! Beautiful! Thanks for the tutorial! They are so pretty! YEAH!!! I've been waiting for this tutorial :) I know what I'm making for Christmas!! sooo cute! I love the shape of these flowers. the effect is just beautiful! Great job! Did you cut the lace out with the die cut as well? These are simply adorable and look so simple to make... I have to try it!! 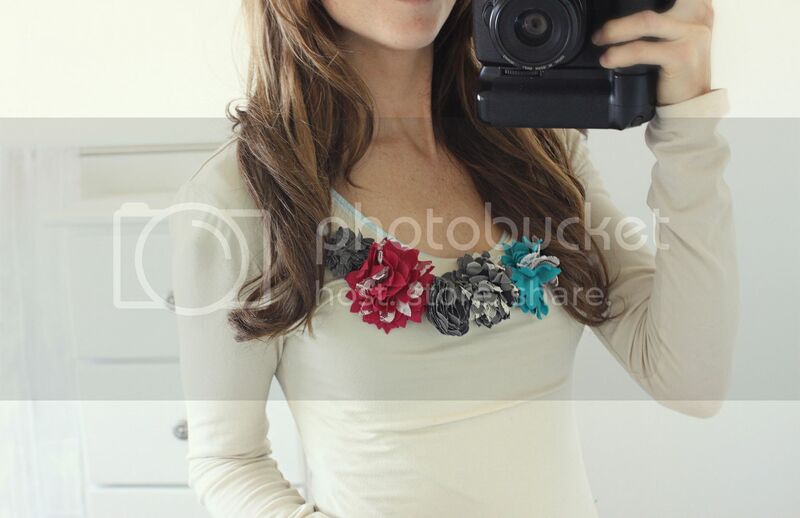 Thanks for the great idea... your shirt is soooo cute! Yea! I have been waiting for this! Thank you SO much for showing us how to make them. You are awesome. Seriously, Thank you. WHOOOAAAAAAAHHHH!! !These are beautiful.I have a Big Shot and LOVE IT!! 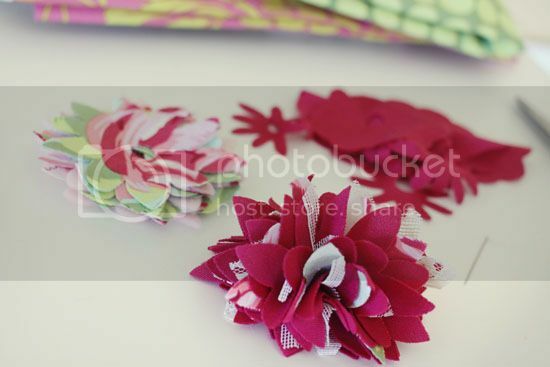 !What sizzix die did you use to make the flowers? Would love to make mommy and me outfits..Girl you totally ROCK!!!! Where did you get knits in cute prints? Did you use old t-shirts? I have been wanting to do this for awhile--just need the time! 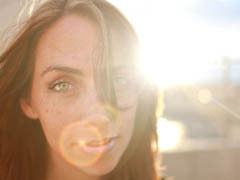 I just found your blog on U Create..
...and I've decided that I WANT TO BE YOU! these are adorable!!! I love the way you dress! I'm definitely going to have to try this. Do you sell these adorable shirts on etsy or anywhere else by any chance. I am not the artsy type but would love to buy them! Please let me know! Much anticipated, much appreciated. Thanks, Liz! That's the cutest shirt ever!! :) I'm all for the handmade Christmas gifts - they're just the best to give (and receive!!...). Those are really too cute! Thanks for sharing! Those are so cute! Thanks for sharing! I am loving this! Gotta try to make this. Saw this on Studio5. LOVE IT!! Thanks for the inspiration. My sisters and I have been crafting tees and headbands for a while now. I am obsessed. Where do you get the large sizzix flower? I can't find it anywhere.